1. Think about what worked this year. That is, what you enjoyed, what enriched your life, what you want more of in 2015. Goal-setting doesn’t have to be about creating a New You every 12 months, and in fact it works better when it’s cumulative. 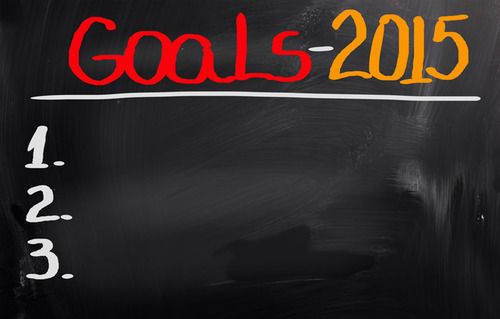 Take some time to revisit your goals for past years, examine the successful (even semi-successful!) ones and think about how you can continue to build on them. If you think about it, it’s the perfect number for anything: enough so that you’re challenging yourself, not so many that you’re overwhelmed. You may prefer two goals, or ten, but the important thing is to have a reasonable, achievable number. 3. Divide your life into categories, and think of a single intention for each area. For instance, you might consider categories like home (goal: finally find some art for the landing wall), relationships (goal: meet up with friends whom you have not seen in a while) and career (goal: compile monthly reports in advance and not the day before). So maybe you want to run a marathon this year. Or buy your first home. Great goals! But why do you want to do those things? What feeling will they help you achieve, or value that you hold dear do they support? Being honest on why we want things helps us clarify if in fact we do want them, or if something else will help us achieve the desired outcome (maybe a half-marathon will give you the same sense of fulfilment, or a lease with a landlord who’s okay with some DIY?) It’s also good to know that we’re focusing on targets that will truly make us happier. Speaking of happy, it seems easy to avoid these days, especially in the arena of goal-setting. As soon as we’ve achieved something, we’re after bigger and better ambitions. Taking time to appreciate what we do have and have achieved makes future goal-reaching all the sweeter. Rietmark was established in 1997 to assist small and home businesses with the marketing of their business or service. Every month 80 000 advertising booklets are printed and distributed in Pretoria Moot, North, East and Centurion. We also offer design and printing services - business cards, flyers, car magnets, banners, chromadek sign boards, posters, vinyl stickers and more! www.rietmark.co.za. This entry was posted in Inspirational and tagged 2015, career, DIY, friends, future, happiness, happy, honest, marathon, monthly, new goals, New year, relationships. Bookmark the permalink.